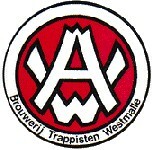 Brewery der Trappisten of Westmalle is a Belgian trappist brewery located in the Trappist Abbey of Westmalle. It produces three beers, which are designated trappist beer because they follow the rules of the International Trappist Association. The brand Westmalle Tripel has been much copied, and is credited with being the first golden strong pale ale to use the term Tripel.